Last Friday, I come home after a good day at the office. I have a productive evening, cleaning, doing odd jobs in my apartment. I exercise doing several sets of sit-ups, push-ups and stretching. I go out for a 4 km jog. I feel great, on top of my game. Saturday, I wake up early around 6 because I want to go to the bathroom. I go to get up and... whoa! I am so dizzy I can't really stand upright. I lay back down to assess the situation. What the heck is going on? I try getting up. Dizzy! Lay back down. Try getting up, whoa! Lay back down. Crazy. What am I going to do? This seems a little scary. After all, I'm by myself and if I can't stand up how would I be able to get help? Finally I manage to stumble to the bathroom and stumble back but I go slowly and am careful to hold onto anything I can to support myself. Oddly enough, I discover in lying back down that I am very dizzy lying on my back but not when I'm lying on my front. I have no idea why but I'm not going to argue with success. If I roll onto my back, a tsunami of dizziness sweeps over me. I don't want to press my luck because I can feel that if the dizziness persists, I'm going to heave ho. I sleep on and off until noon or 1pm and finally venture upright to test the waters. So far, so good. I seem to be able to function now in an upright position without any dizziness but I know that I'm not feeling one hundred percent. Hmmm, a touch of the flu? Overtired? What else? Now I'm having crazy ideas of something environmental. The apartment is new, well, new for me and management did paint it. Paint fumes? The place does have its own odour but then again, every place has its own odour. I take it easy all day but manage to get a little work done. However, when I go to bed, I run into the same phenomenon. If I lie on my back I get one heck of a dizzy spell. If I lie on my front, I seem to be okay. Alrighty then, do not lie on my back. Can't get any simpler than that. Sunday, while I still feel something odd like I may be only back to 95%, I feel well enough to go about my day. I even go to the office for a bit. In the evening, I decide to go out for a jog however, before doing so; I decide to do some sit-ups. I get in about 10 before my head starts getting light. I stop at 15 realising I'm getting dizzy. Hmmm, of course, I'm starting in a position where I am lying on my back, the same position which bothers me in bed. I wait a bit then go out for a short run but I take it easy. Of course, when I do go to bed, I sleep on my stomach. Monday, I'm feeling off. I can feel that I'm not perfect. I decide to go see a doctor. I get the usual Q & A then the doctor has me do a few things. I have to walk one foot in front of the other like walking a line for a sobriety test. I have to follow her finger with my eyes without moving my head. She looks in my ears and eyes. Finally, I get her diagnosis: I have benign paroxysmal positional vertigo. What? I recognise the word benign - Whew! There I am wiping my brow with the sleeve of my shirt! - and the word vertigo. The rest of it? This fancy sounding expression refers to a condition of the inner ear. We determine position by the fluid in our inner ear. Small particles call otoconia in the fluid press against hair cells and the manner which they press permit us to recognise vertical and horizontal positions and movement. 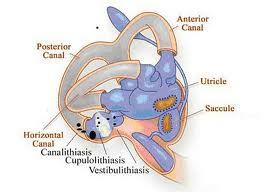 With BPPV, it is thought that the otoconia become dislodged and move into the surrounding canals and build up there. This upset to the ear mechanism results in dizziness in certain positions. I notice that the literature uses a more vernacular term by calling this "debris" or misplaced otoconia "ear rocks". Being small crystals of calcium carbonate they have a slow turnover rate but are thought to dissolve naturally and are reabsorbed by the body although the experts are not completely in agreement with this idea. The main treatment consists of various exercises of moving the head which attempt to reposition these particles, the otoconia into a more favourable place in the ear. Hmmm seems odd. While this condition can strike anybody, the older you are the more likely it is that your dizziness is due to BPPV. Apparently 20% of all dizziness is due to BPPV and while this is more likely as one gets older, this problem can apparently affect anybody since the condition is also caused by head injury, infection or a disorder of the inner ear. For me, this entire incident raises the issue of living alone. The biggest problem with living alone is... well, living alone. Anybody checking up on ya? Member of the family drops by periodically to see if the body is still warm? In 1992, I moved back to Toronto into a 4th floor bachelor apartment in the Annex. The lady next door was 72 years old and lived by herself. A Sunday night, I came home around 9pm and heard an odd but brief noise from her apartment. Since the noise didn't repeat, I wasn't sure of what I had actually heard so I didn't give it another thought. Monday morning, I'm going out the door to work when I hear something coming from the lady's apartment; it sort of sounds like groaning. Hmmm, what to do? Get the super? I see a guy from down the hall and mention this. He gets agitated saying, "Oh my goodness. Mrs. Smith has had a seizure again." He knocks on the door. No answer. Finally the young lady next door to the older lady comes out of her apartment. The guy confabs a bit and the young girl lets him into her apartment. The guy goes across the balconies - remember this is the 4th floor - and gets into the elderly lady's place. Well, the story ends with an ambulance and the lady getting carted off to the hospital. She had collapsed Sunday morning, some type of seizure, and had been lying on the floor of her kitchen for 24 hours unable to get up and do anything. If it had been Saturday, there's a good chance she may have laid there all weekend. The point is that we normally don't think of these types of problems. We're in good health; it is rare that somebody has a sudden debilitating event which leaves them incapable from phoning for help. But it can happen. And as odd or morbid as it may seem, just who does drop in regularly to ensure the body is still warm? It's 1994. I've come down with something that leaves me talking to Uncle Ralph on the white telephone quite a bit. Ah, I find that euphemism for vomiting to be quite amusing! [laughs] In a nutshell, after 3 days I manage to phone my father who comes from out of town to pick me up and I end up in the hospital. I hadn't realised how dehydrated I had become because I couldn't keep anything down. Not good. Fortunately, I had my parents to call. Since I've just now moved into an apartment by myself, the thought did cross my mind of how I would handle my situation if I had a critical problem. And guess what, here I am with BPPV! A curious sidebar: My father in the last 10 years of his life suffered from mild seizures periodically. Since my mother had died, he was living by himself so he signed up for a service called Lifeline. The service had a unit connected to the phone and he wore a pendant that had a button he could press to activate the unit's automatic dialing feature. It would call the central service for help. Also the unit had a button where my father had to press it once every 12 hours. If he failed to do so, the service would first call then if there was no answer, would send somebody to check on him. Obviously if he was going out or was away, he notified the service. Last night I go to bed and sure enough, if I lie on my back... whoa! A wave of dizziness just washes over me. From now on, for the moment at least, I have to sleep on my stomach. As the literature states, the condition causes vertigo only with certain head positions. I just got up and I think I feel okay but there's something. I don't know what it is but I still feel odd and it comes back I guess to this question of balance. Damn, it's obvious that this isn't something which is magically going to go away. The doctor printed out a document on BPPV and I'm going to read over these supposed exercises with the idea of getting started right away. I really would like all this to just go away. It's disconcerting feeling "odd" all day and now that I realize my problem position is lying flat on my back, I know this is going to affect not only my sleeping, I am going to be unable to do certain workout exercises like sit-ups. Geesh, imagine you are impeded from doing what is necessary to remain physically fit? This almost seems like a snowball effect: one problem causes another problem. Ha! What's that old saying? Health is everything! A few weeks ago, on a Saturday around 3pm, after an up to that point busy day, I start feeling odd. I lie down. I realize I'm feeling dizzy. This persists and I can't get back up. When I do, I start feeling nauseated like I'm going to chuck. I spend the rest of Saturday sleeping on and off. Finally around 11pm, I get up and manage to take a shower then go to bed for the night. The next day, I'm better; no dizziness. This is the only time since last year I have suffered an incident similar to what I have described above. It's scary. When I first researched the condition, I read accounts from people who had suffered this for years. Oh boy, I hope I avoid that! There seem to be a number of similar treatments: Epley, Semont and Brandt-Daroff. All attempt to physically dislodge the "wandering" ear rocks by repositioning the head. Apparently this can decrease or cure a person's vertigo. Note that there is no medication per se and surgery being dangerous isn't usually an option.